This adventure clocks in at 32 pages, 1 page front cover, 1 page editorial/ToC, leaving us with 30 pages of content, so let’s take a look! 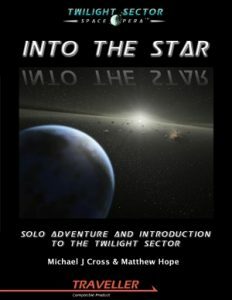 Now, first things first: This acts as an introductory adventure for the Twilight Sector and also as a solo-adventure – not “solo”, as one GM and player, but as “choose your own adventure”-solo! The pdf assumes the use of the Mutant Creation rules – you can play a Mod SIM (scientifically induced mutation, weak social standing -1) or a Natural mutant (NM, weak social standing -2); with Resis Capra, we get a sample pregen for your use if you don’t have the time or inclination to make one yourself. A d66 table for negative and positive mutations is provided, including the respective descriptions. Editing and formatting are okay, if not perfect – particularly the images overlapping text is annoying indeed. Cartography and interior artworks are b/w and nice. Layout adheres to a 1-column b/w-standard and the pdf internally hyperlinked – clicking on “go to #X” will put you at the respective entry. Michael J Cross and Matthew Hope deliver a per se nice, unpretentious solo-adventure here; while it’s not exactly mind-boggling, it makes for a solid form of entertainment for a while. That being said, the overlay issues are really grating and drag down the experience a bit. At the same time, this is FREE. And honestly, as a FREE supplement, this is worth checking out if you need your RPG-fix and are in the mood for some scifi/space opera action. Hence, my final verdict will clock in at 3 stars. You can get this adventure for FREE here on OBS!